1 1 4 Washer (for 3/4 ” bolt) 45° Fitting Cotterless Hitch Pin Hydraulic Hose Air Valve Assembly Handle Handle Grip Extension Tube Pin Saddle Tube Piston Assembly Wear Ring Hex Nut (5/8-11; torque to 80-110 ft. lbs.) Lock Washer (for 5/8 ” bolt) Cover Plate Body Weldment Wheel (6 ” dia.) Cotter Pin Part Number Decal Hex Hd. Cap Screw (1/2-13 x 1-1/4 ” lg.) 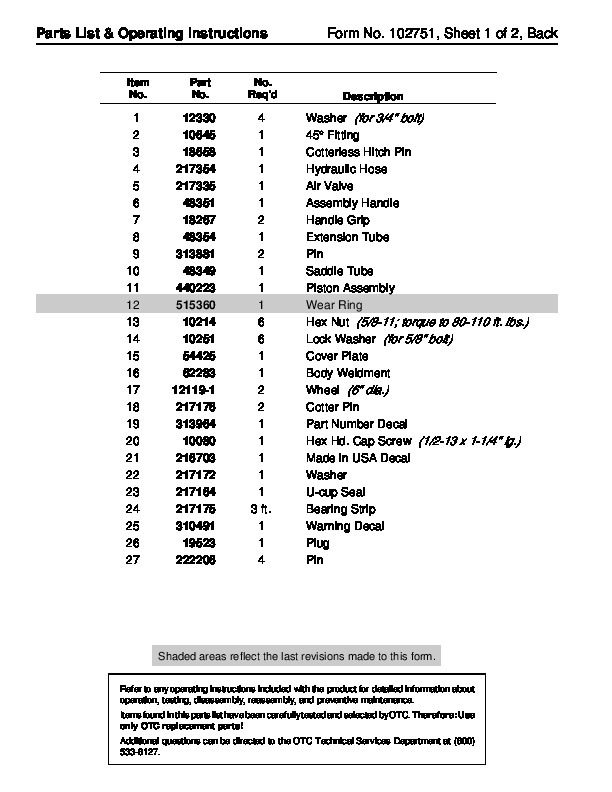 Made in USA Decal Washer U-cup Seal Bearing Strip Warning Decal Plug Pin Shaded areas reflect the last revisions made to this form. Refer to any operating instructions included with the product for detailed information about operation, testing, disassembly, reassembly, and preventive maintenance. 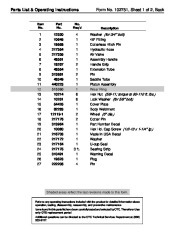 Items found in this parts list have been carefully tested and selected by OTC. Therefore: Use only OTC replacement parts! Additional questions can be directed to the OTC Technical Services Department at (800) 533-6127. 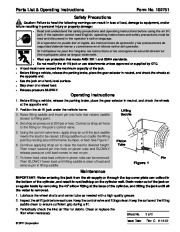 Parts List & Operating Instructions Safety Precautions Form No. 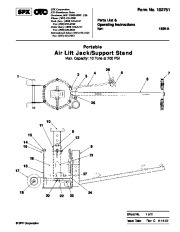 102751 Caution: Failure to heed the following warnings can result in loss of load, damage to equipment, and/or failure resulting in personal injury or property damage: · Read and understand the safety precautions and operating instructions before using the air lift jack. 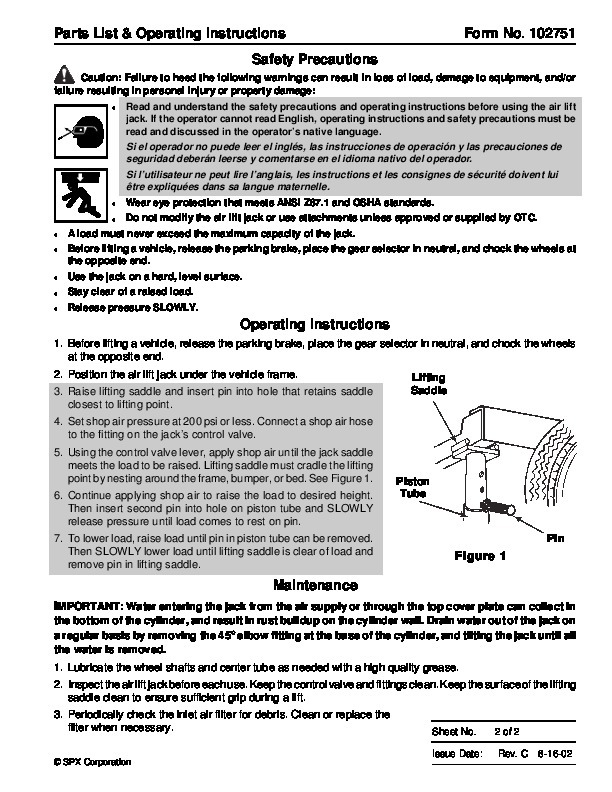 If the operator cannot read English, operating instructions and safety precautions must be read and discussed in the operator’s native language. Si el operador no puede leer el inglés, las instrucciones de operación y las precauciones de seguridad deberán leerse y comentarse en el idioma nativo del operador. Si l’utilisateur ne peut lire l’anglais, les instructions et les consignes de sécurité doivent lui être expliquées dans sa langue maternelle. Wear eye protection that meets ANSI Z87.1 and OSHA standards. 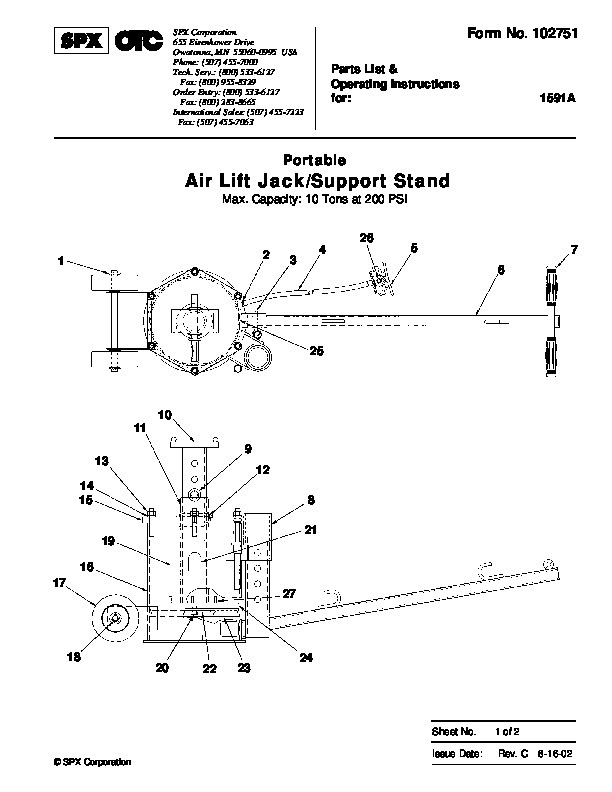 · Do not modify the air lift jack or use attachments unless approved or supplied by OTC. A load must never exceed the maximum capacity of the jack. Before lifting a vehicle, release the parking brake, place the gear selector in neutral, and chock the wheels at the opposite end. Use the jack on a hard, level surface. Stay clear of a raised load. Release pressure SLOWLY. Operating Instructions 1. Before lifting a vehicle, release the parking brake, place the gear selector in neutral, and chock the wheels at the opposite end. 2. Position the air lift jack under the vehicle frame. 3. Raise lifting saddle and insert pin into hole that retains saddle closest to lifting point. 4. Set shop air pressure at 200 psi or less. Connect a shop air hose to the fitting on the jack’s control valve. 5. Using the control valve lever, apply shop air until the jack saddle meets the load to be raised. Lifting saddle must cradle the lifting point by nesting around the frame, bumper, or bed. See Figure 1. 6.